Sendible offers a user-friendly dashboard to manage multiple clients and networks, which can be particularly useful for agencies. The lower-tier plans are affordable, but you might find you need to upgrade to the pricier packages to benefit from all of the features and resources, which could make this unaffordable for smaller teams. 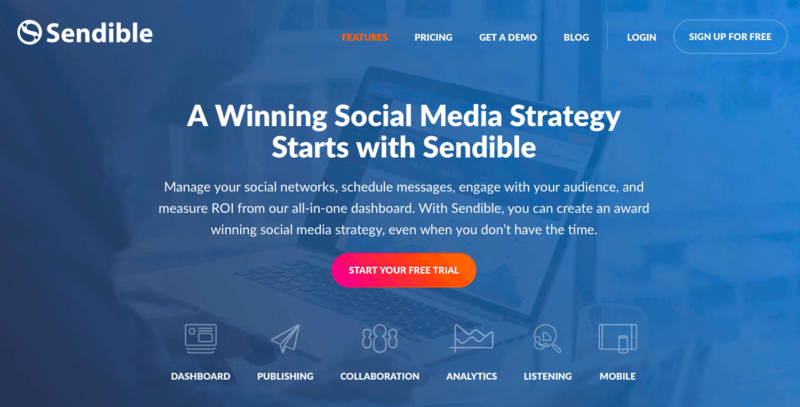 Sendible – Is it really a valid alternative to Hootsuite? Sendible is a social media management tool for SMEs and corporate marketing teams’ to promote, analyze and track their brands across all social media platforms and for digital agencies who want to manage social media for multiple clients. Founded in 2009, it’s definitely one of the smaller companies, with only around 20,000 customers around the world. However, many claim that its simple, user-friendly interface offers a fresh alternative to Hootsuite’s “clunky” dashboard. Does its small size mean it can be more agile and adapt faster? Or are you better served going to one of the bigger players in the industry? It supports all the usual social media platforms including Facebook, Facebook Ads, Twitter, Instagram, Linkedin, Google My Business, YouTube, and Pinterest, as well as various blogging platforms like WordPress, Medium, and Tumblr. As it’s designed for agencies, you can manage up to 192 “services” (classed as an interaction with any social network account), as well as adding twelve users to the account. All plans come with a fully-functional 30-day free trial, so if after reading this review, you’re still on the fence, you can create an account and access the dashboard risk-free. This review is going to tell you everything you need to know about Sendible; from its features and ease of use to the analytics and reporting functions. I’m even going to set up an account, test it, and then cancel it and get a refund, with step-by-step instructions from start to finish. Is it possible to track mentions of keywords/hashtag/location via search? What kind of reports can you get and can you export them? Is it easy to set up a new account? What are the customer service options? Is the pricing affordable for you? What features are included in each plan? By the end of this review, you’ll know whether Sendible is a good fit for your agency or SMB, and why. 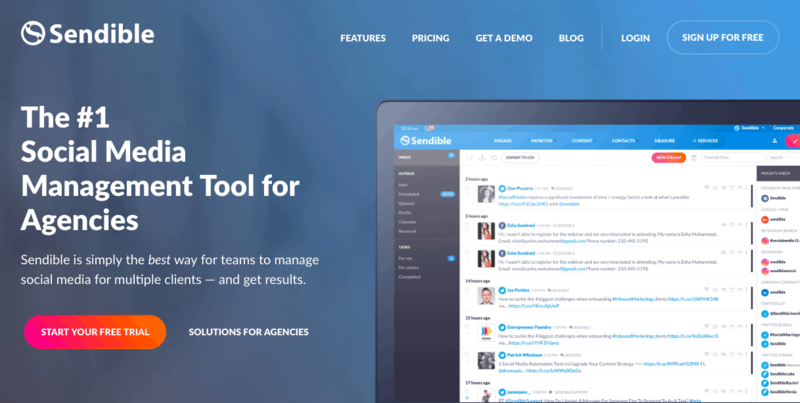 Sendible has tons of features designed primarily for agencies or SMBs. Its built-in CRM will allow you to target and connect with users on social media to build relationships, while the Share Button allows your visitors to share content straight from your website. There’s no doubt the packages are feature-packed, but be warned: many of the features or allocations (number of users, posts, connections with networks, and so on) require an upgrade. Sendible’s centralized dashboard allows you to engage, respond, and track activity from one central location. With all of your social media activity in one channel, you no longer need to switch between multiple streams. The interface is user-friendly, allowing you to upload, search, and view content in a number of different ways, plus its timeline view is easy to navigate and you can easily control what content is included in the inbox. The interface can be a little clunky, though – for instance, sometimes when I approved a message, I had to refresh to see it leave the queue. If you’re looking for the option to send automated messages to new Instagram and Twitter followers or access social profiles directly through the platform, you’ll need to look elsewhere. Minor issues, but, something to consider. 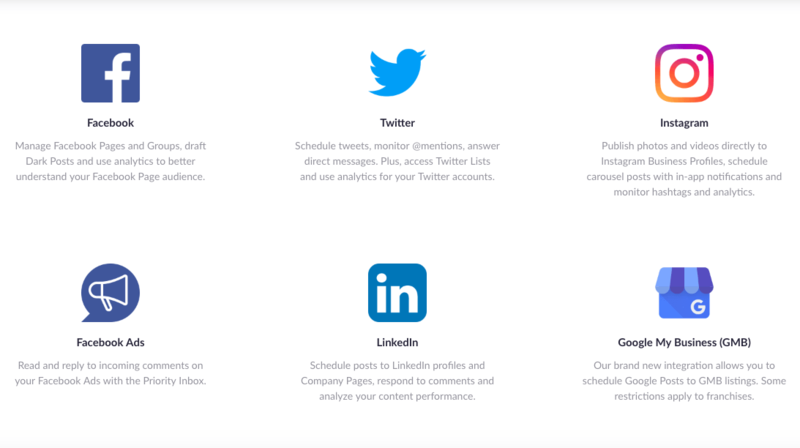 Sendible can track mentions of predetermined brand, competitor and key industry terms. When one of your keywords is mentioned, you’ll receive notifications by email, Slack, or inside the Sendible dashboard. This means you can stay on top of positive and negative customer conversations. In addition, the Automatic Sentiment Analysis allows you to track what is being said about your company and respond to urgent issues before they get out of hand. Overall, monitoring options could be improved. For instance, I’d like to be able to monitor specific words just on specific pages – but again, it’s not a huge problem. 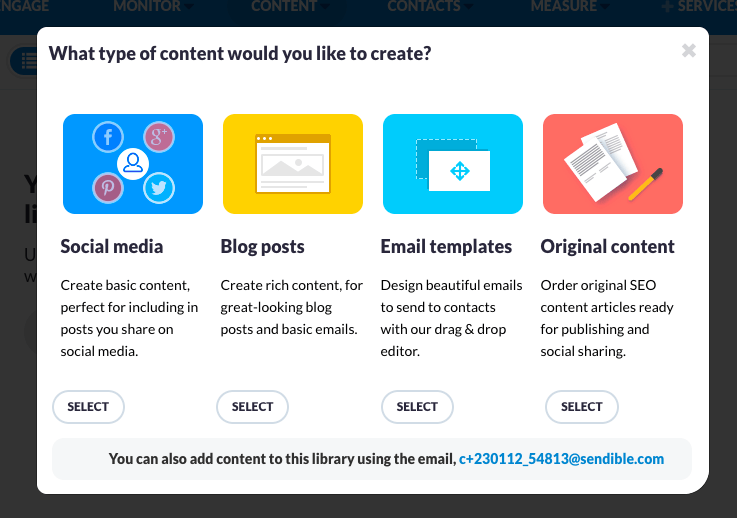 Sendible allows you to publish, schedule or queue posts across all profiles at once using its Compose Box. While this is convenient, I would have liked to see a preview mode for social posts. Currently, once a post is scheduled, it can be quite hard to spot layout or formatting errors. Posts can be sent to blogs, networks, email lists, and even scheduled ahead of time. There’s no limit to how far in advance you can schedule content, but there is a 200 per day limit for daily posts. However, it’s unlikely that many companies will exceed this limit. You can visualize and edit your content schedule in the content calendar, which has a convenient drag-and-drop interface. Although I like the calendar feature, it can be slow to load, and I have had issues with scheduled posts not posting to social media networks, despite saying sent in Sendible. Sendible is designed with teams and agencies in mind, so it’ll come as no surprise that there are features specifically for collaboration. This is where the tool really shines. It offers an integrated approval workflow that makes it easy to collaborate with others and make sure that every post has multiple eyes on it before it goes live. You can receive and manage approval requests via your email, so you don’t need to log in at all. You can allow multiple team members to contribute to a post, assign tasks to individual team members, or even create specific roles, responsibilities, and access for each user. If you’re an agency or large business, it can be hard to come up with a consistent stream of useful content to create and share. Sendible will analyze content shared on social media and suggest a list of relevant content ideas. Just a few steps and you are provided with new content ideas on a daily basis that you can then easily turn into posts. The suggestions and keyword tools also help discover and develop new content to post to social channels, keeping you and your clients’ social media feeds up to date with current happenings, and information that may be of interest to our clientele. 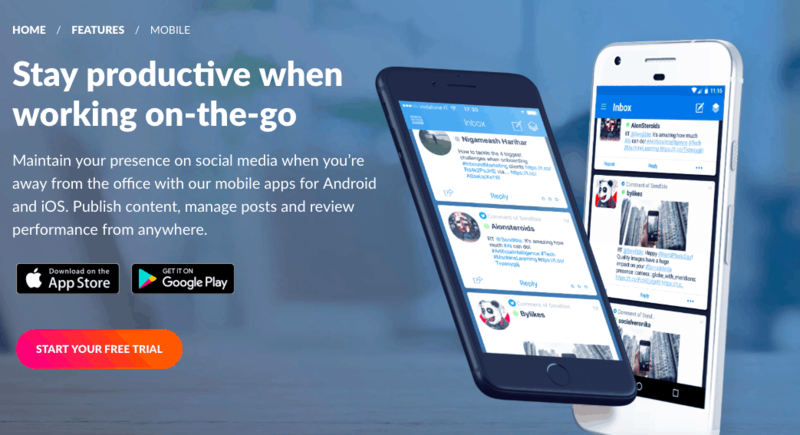 Sendible has mobile apps for both Android and Apple, so in theory, it should be easy to publish content, manage posts and review performance from anywhere. Not only can you respond to messages via the app, but you can also publish posts, keep track of your analytics, and stay on top of social listening. While this is all great news, and the app usually works perfectly, it does sometimes crash, and the push function to Instagram can be quite slow. That said, it’s clean and user-friendly, and much better than other social media tool apps I’ve tested. In addition to most social media networks, Sendible integrates with many tools and apps, including Google Analytics, DropBox, Canva, Slack, and Google Drive, as well as blog platforms like WordPress, Tumblr, and Medium. There are even some social media marketing tools, including Facebook Auto Moderator (to automatically delete comments based on specific keywords, which you can set yourself), RSS Feed Importer, and a Google Chrome extension (publish or schedule content while browsing the web). The platform as a whole is intuitive and easy to use. Small features, such as the auto-repeat feature for scheduling social media posts and the extremely helpful pop-up information text for the analytics, make Sendible convenient to use. It’s a real timesaver, especially when dealing with multiple clients and team members. The “My Content” section is intuitive. If you’re an agency, simply set up a library for each of your clients and add relevant content there for future use. When you’re ready, you can schedule the post directly from the library. The Chrome extension, although it can be finicky on occasion, helps with this process. You add a webpage from anywhere to the content library, with just a couple of clicks. 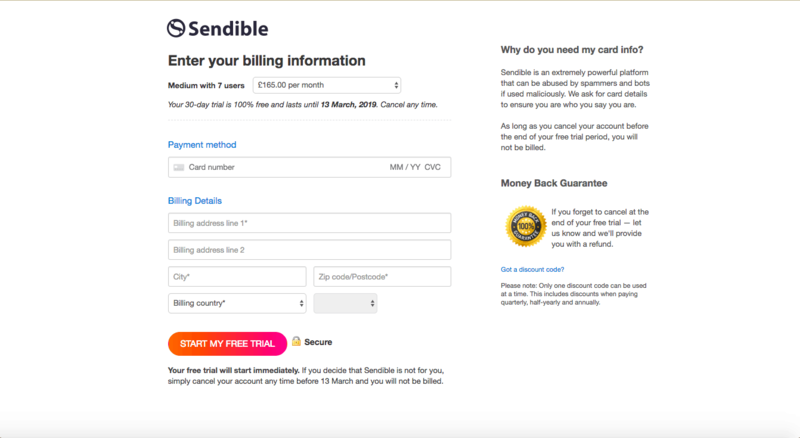 Creating an account with Sendible was easy. It’s free for the first 30 days, although I did need to add my credit card details. Considering the range of features is so comprehensive, the dashboard is easy to set up and use, with a minimal learning curve. The user experience is well-thought out and what’s more, you can access it on both a desktop and mobile, although the latter could be improved, as it can sometimes be slow to load. 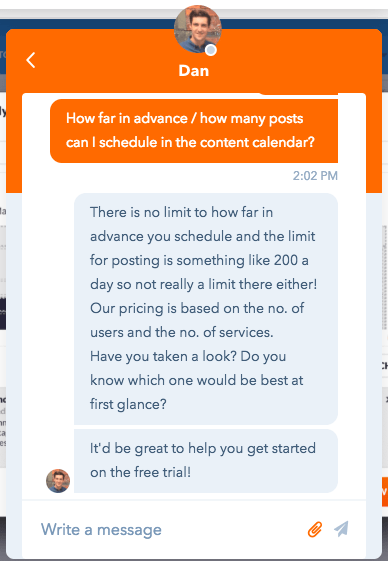 If you are an agency with multiple clients and multiple social networks per client, Sendible will save you time. Once you’ve connected all of your accounts, you can easily sort through clients and schedule posts for multiple accounts. Sendible makes it easy to monitor accounts, engage with followers on behalf of your clients, repost, retweet, etc., and to share tasks within your team. Another great feature for agencies is the analytics and reporting functionality. Data and statistics pulled in from your social media channels can be turned into interactive graphs. You can choose either pre-made templates or your own customised presentation. The analytics dashboard is easily accessed via the admin area. It’s easy to navigate and understand, and it has a clean interface. I would have liked to be able to customize the view, but that’s only a minor issue. The dashboard provides information and reports on all of your connected social media accounts. As well as being able to review statistics for individual networks (e.g. Facebook likes, comments, and shares, or Instagram audience and engagement), you can view an engagement report, which tracks the performance and metrics across all of your connected accounts. The dashboard also lets you build and download reports. This feature is ideal for agencies, who can choose from ready-made report templates which can then be customised with one of 250 drag-and-drop modules. For instance, you can identify the best post times or update your clients on the number of likes and followers. What’s more, you can automate the whole process. After the setup work is done, you can send regular reports to clients or team members on a daily, weekly, or monthly basis. The reports are truly one of Sendible’s best features, but a minor gripe is they can take a while to generate. Sendible integrates with your social media accounts (Facebook, Twitter, Instagram, Google+, Linkedin, YouTube, and Google Analytics) with just a couple of clicks. Once Sendible is connected to a social media account, it will pull in all of the data from the relevant analytics. Read more about my experience with Sendible’s analytics. As with any new platform or tool, when you get started with Sendible, there is a learning curve. However, customer service is available to help you and the quality of support is high. Feedback and feature suggestions are often taken into account, so it does feel as though Sendible cares about its customers and wants to improve the product to meet their needs. If you want to give Sendible a call, there are local U.K., U.S., and European numbers, plus a variety of digital methods. There’s also a useful help desk with FAQs, articles, and video tutorials. My main surprise was to find out that normal working hours are from 9:00 AM to 7:00 PM UTC Monday to Friday, and there would be a delay on all requests sent after normal working hours of operation. Plus, you should only expect a response within 48 hours. I contacted the team via live chat at around noon on a Monday. The conversation was initially picked up by a bot, but was immediately passed on to a real person. I asked how many social networks I could connect and was advised instantly. The support agent was polite and friendly, resolving my question straight away. On the website, there is an online contact for sales inquiries. I emailed around 6:00 AM U.K. time to ask how to schedule a message to several social accounts at once. 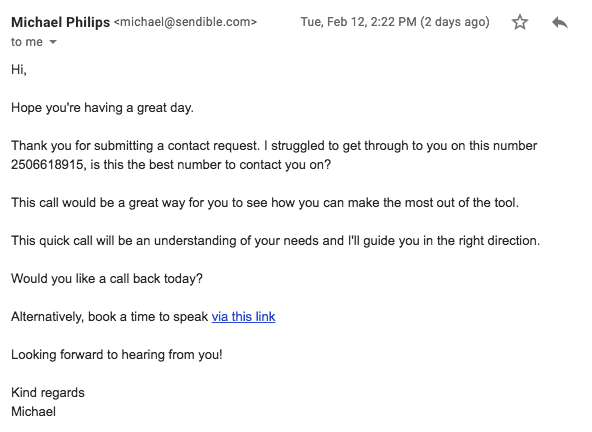 I did receive an email reply within 6 hours, but it was more a sales tactic to get me to hop on a call with the team. Perhaps this was because I emailed the ‘Sales Inquiries.” Regardless, I was left without an answer to my quite basic question. When you’re logged into the admin, you can submit a support ticket. I sent a question to ask how I could view my bill online at around 6:00 AM on a weekday morning. I received a reply within 7 hours, answering my question in full. The operator was helpful and very welcoming. Sendible’s packages range from an affordable single person plan to a relatively high-priced agency package with up to 12 users. Overall, compared to other similar services, it is competitively priced, with a comprehensive level of features included. My main issue with the pricing is the features and resources (e.g. number of queues) are capped in the lower level packages, so unless you are careful, you might find you’re inadvertently pushed into a higher tier package. You can pay with any major credit card and plans can be purchased in one-month or one-year terms, with a 15% discount for the latter. There’s a 30-day free trial which enables you to access any of the plans, but you do need to add your credit card details and make sure you remove them before the trial ends (your payment will be refunded if you forget). I started a trial with Sendible and subsequently canceled the account. 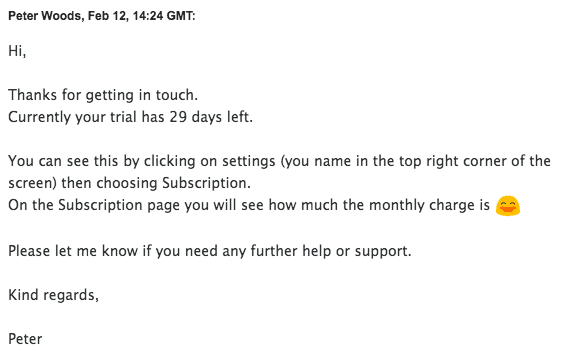 As it was before the trial ended, I was not billed, despite having added my credit card details. The whole process could be done online and I did not need to contact support to get assistance. Read more about my cancellation experience. Sendible offers a user-friendly dashboard to manage multiple clients and networks, which can be particularly useful for agencies. There are tons of features. You can run into buggy functionality, such as the send feature and the mobile app, but overall, the user experience is good. The lower-tier plans are affordable, but you might find you need to upgrade to the pricier packages to benefit from all of the features and resources, which could make this unaffordable for smaller teams.